Designed for 1965-Up street 326-455ci Pontiac V8s (except Ram Air V). Can also be used for high-performance marine applications.Designed for 1965-Up street 326-455ci Pontiac V8s (except Ram Air V). Can also be used for high-performance marine applications. Will not fit under Trans-Am shaker hood without modifications. No provision for OEM choke. OEM carb requires conversion to electric or manual choke. 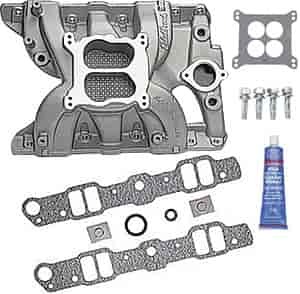 For 1968-71, use Edelbrock 350-8015 bracket. These dual plane, high-rise intakes make incredible horsepower to 6500 RPM, along with streetable torque for great throttle response. Such a broad powerband makes Performer RPMs a great choice for competition engines. Their larger plenums and runners match the free-flowing exhaust, high-lift cams, and other modifications of a high-output engine. However, they are not for emissions-equipped engines. Get even more outstanding performance by matching a Performer RPM camshaft and cylinder heads to your intake.